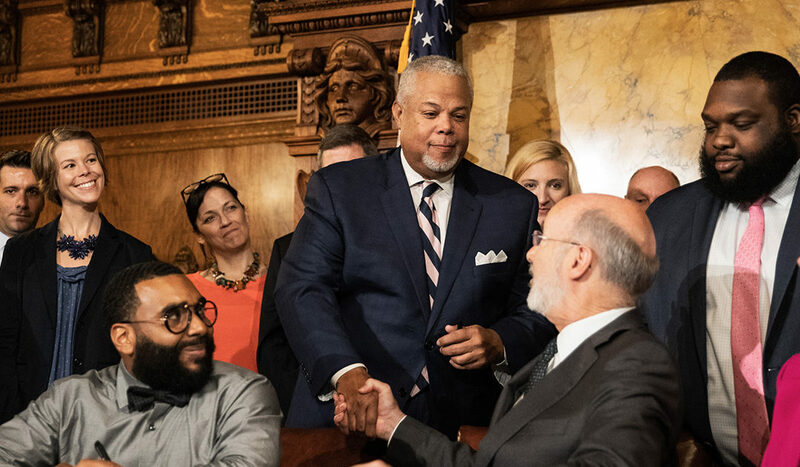 Harrisburg, July 3, 2018 – Last week, Senator Anthony H. Williams (D-Philadelphia) joined Governor Tom Wolf, lawmakers, and advocates for the signing of House Bill 1419, also known as the Clean Slate bill. The legislation allows for an individual to petition for court records to be sealed after 10 years of living conviction free. The primary goal of Clean Slate is to ensure that those who have been convicted for minor offenses in the past, and have served sentence, to no longer be plagued in the job and housing market by their mistakes. Williams was the prime sponsor of the Senate’s version of House Bill 1419. He says he looks forward to seeing the improved lives of those who are re-entering society after serving their time and seeing how recidivism is reduced be providing the opportunity for individuals to enter the workforce.